BALTIMORE — On a sunny Tuesday morning one week after riots and looting upended the city, Democratic media consultant Martha McKenna was feverishly typing on a laptop at her dining room table, which was half-covered in various printed lists and Maryland Food Bank invoices, with a cellphone balanced between her ear and shoulder. It’s the same table elected officials gathered around after the city’s curfew in the days following the riots to strategize how to deliver food and supplies to neighborhoods that had lost their already scarce shopping options to the destruction. The Baltimore native’s personal Twitter feed and Facebook page had transformed into a bulletin board of announcements for volunteer opportunities at food drives, with a wealth of willing people in need of direction for their energy. That’s continued since, with the emphasis shifted to improving on other issues — such as underfunded recreation centers — the city suffered from long before the recent riots. The tension in the city had receded after the May 1 announcement of indictments against six Baltimore police officers in the death of Freddie Gray. Still, four days later, McKenna hadn&apos;t stopped working with elected officials in their collective quest to ensure life went on and could possibly even improve in the city where she’s lived nearly her entire life. On this particular day, aside from watching her client’s mayoral re-election returns in South Bend, Ind. (he won), McKenna was organizing the delivery of flowers to senior-living facilities across the city. The flowers were intended for a since-canceled women’s leadership conference in Baltimore her firm McKenna Pihlaja had been hired to organize and advertise. McKenna all of a sudden had free time to devote to the city’s recovery, as well as a built-in network of connected women who wanted to help. McKenna, 40, who dubs herself in her Twitter bio the "unofficial ambassador of Baltimore," is a former political director and independent-expenditure director at the Democratic Senatorial Campaign Committee and was a longtime operative at EMILY’s List. She has 1- and 2-year-old daughters and commutes daily to her firm’s headquarters in Dupont Circle. But her years in Democratic politics also led to plenty of work at home in Maryland, where her connections proved helpful amid the recent turmoil. On April 28, the day after the riots, more than 2,000 people participated in the cleanup of the looted stores and streets, according to the Baltimore Sun. So when McKenna called around mid-morning looking for a place to help out, she was told to find another avenue. She rang state Del. Antonio Hayes, whom McKenna first worked with on a 2002 gubernatorial campaign and who is now a freshman representing Penn North, a central point for the riots and media coverage. With the CVS at the corner of Pennsylvania and North avenues looted and burned, Hayes headed straight to the adjoining building, where 62 seniors live, and relayed to McKenna what he learned: Their hot lunch would not be delivered that morning as scheduled. 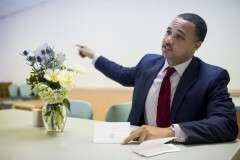 “I immediately realized once we didn’t have the CVS that the seniors here would lose that access to their prescription drugs,” Hayes said on May 5 in an interview from the building’s lunchroom, as he signed “Happy Early Mother’s Day” on cards for flower arrangements. The torched meds proved a more complicated challenge for Hayes to solve, but McKenna darted to her local grocery store’s cold-food counter, asked for everything they had, and then bee-lined for Penn North. The area was still mobbed with people and law enforcement, and some of the streets were shut off. Hettleman, who worked on Sen. Barbara A. Mikulski’s, D-Md., first election to the Senate in 1986 and is a former campaign manager to Sen. Benjamin L. Cardin, D-Md., went with a friend to BJ’s Wholesale Club and delivered food that could be easily served that night, as the city began to shut down with a curfew and fears of future riots. They also worked to get food and supplies delivered across the city, where state Del. Cory McCray was holding a youth meeting that night on the east side, which also had seen extensive damage. With many residents landlocked and the Maryland Food Bank needing some organization for drop-off points, Hettleman worked with the director and Hayes to set those up, and they all began alerting volunteers about the first major tractor-trailer delivery for thousands of pounds of food the next day. Gatherings at McKenna’s house included Hayes, McCray, Hettleman, Del. Brooke Lierman, state Sen. Bill Ferguson and others. They pushed to get as much food out as possible by April 30, with the police report expected the following day causing plenty of anxiety about the ensuing response. With the critical and chaotic first few days now in the rearview mirror, McKenna and the elected officials have been able to move forward with the next set of priorities. Food banks shined a spotlight on the grim conditions of the recreation centers that hosted them, and McKenna and Hayes raised $7,000 in 48 hours for new soccer balls and other equipment. Meanwhile, thanks to a friend who volunteered alongside her firm’s partner Jen Pihlaja, the U.S. Soccer Foundation has identified the Lillian Jones Recreation Center for possible construction of a new soccer pitch. But, standing in front of the CVS on May 5, Hayes told McKenna and Hettleman there is no soccer league to connect it to in West Baltimore, so the effort would have to start at ground zero. “This is a story that just hasn’t really been told — the kind of critical work that had to happen in the community and frankly has to continue happening,” McKenna said. McKenna said there is also a renewed effort in the city to find private funding to expand a jobs program beyond the 5,000 summer jobs Mikulski has always worked to federally fund. She said more than once she was simply in the right place at the right time and continued to point to the work of the new and young state legislators. But her own efforts were well known to a senator who happened to drop by a Starbucks a block down the street from McKenna’s house on the way to meet with Attorney General Loretta Lynch. 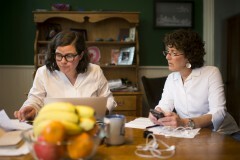 Related: For Campaign Moms, Politics is Child&apos;s Play All Politics is Personal for Martha McKenna McKenna to Lead DSCC&apos;s IE Program Baltimore Riots Change Senate Race Conversation Roll Call Race Ratings Map: Ratings for Every House and Senate Race in 2016 Get breaking news alerts and more from Roll Call in your inbox or on your iPhone.